1. What are the Getting A Grip Business Training Materials Guides? 2. What makes this time management programme different from all the other time management programs around? 3. What are the benefits to me of using these materials? 4. What are the modules? 5. Exactly what’s in the Participant and Facilitator Packs? 7. How do I acquire the Getting A Grip Business Training Materials Guides? 8. Can facilitators anywhere round the world be licenced to purchase these materials, and how easy will it be to get my supplies? 9. What kind of people take up these licences? 10. How do facilitators become trained? 11. Can the material be customized? 12. Can I practise any one module without first acquiring the core module Getting A Grip on Time? 13. What size group is ideal to train in the Getting A Grip Business Training Materials Guides? 14. How much does it cost to practise the material? After many years of being asked to make her programs available for other trainers, international time management specialist and author Robyn Pearce has created a complete package for other trainers and facilitators to use, with or without special training. The system is a series of comprehensive practical productivity and time management-related programs supported by a wealth of material – participant workbooks, comprehensive facilitator manuals, four books, audio CDs, a DVD and online support. Most programs are designed by people who appear to have been born perfect! Not these! Robyn Pearce started her time management business in New Zealand back in the early 1990s in response to public demand, after spending some years learning to overcome her own poor time habits. These programs are full of very down-to-earth practical information, written by a reformed ‘time-aholic’. Who would you want to learn from – someone who has good theory, or someone whose mistakes forced her to understand the theory; someone who learnt her subject the hard way, who knows the short-cuts and practical applications? Over the last thirteen years the programs have been extensively tried, tested and refined in New Zealand and Australia – two nations of very practical no-nonsense people who don’t waste money on fancy jargon and unnecessary complexity. These are not ‘death-by-PowerPoint’ programs, to the relief of nearly everyone trained with this material. They’re dynamic. You can create your own PowerPoint slides if you want to, but this material is designed to be run with flip-charts and/or a whiteboard. This of course not only makes the programs very easy and inexpensive to roll out anywhere, without reliance on technology, but also much more user-friendly. There are many time management programs out there, but only a handful are supported by any books, let alone such easy-to-read ones as Robyn’s. Her books are best-sellers in Australia and New Zealand, and are now being sold around the world, including in translation. Also, she’s constantly writing new books to support emerging needs and new programs. Unlike a number of time management programs, participants don’t have to purchase an expensive diary or organizer. The core module in this series instead gives you guidance on what to look for and suggestions on ways to integrate your new knowledge with whatever diary system you’re currently using, whether paper-based or electronic. Of course we help with recommendations as required, but selling diaries is not our core business. Instead, we focus on giving people the tools and information to make better time choices. There are a number of regularly revised and updated online resources to back up the content and to support both participants and facilitators, and new items are regularly added. Huge time saving. If you’ve ever had to create training manuals for participants and trainers, you’ll know how much time it takes. Thousands of hours have gone into creating these programmes, they’ve been road-tested in many markets and countries, and they work. The comprehensive facilitator/trainer notes include many suggestions on how to get the best out of your participants, with suggested variations for different groups. Top level information without having to be the expert yourself. With this amazingly low fee and simple system you tap straight into the knowledge of one of the world’s top international experts on practical productivity. Robyn Pearce has specialised in this area for over 13 years, her books and other materials sell in an increasing number of countries, and she’s constantly speaking to large and small audiences around the world. This constant personal involvement in her topic, plus the input of new audiences, keeps her material always fresh, practical and up to date. Regular updates. Robyn is constantly researching and writing about the latest thinking in the field of productivity and time management, and licencees will get the benefit of this knowledge first. Again, your time is saved – why not let someone else do the hard work of keeping abreast of new developments and updating the materials while you concentrate on rolling out quality programmes? People walk out of Getting A Grip Productivity programs saying, ‘That was really practical. I can’t wait to get started.’ Robyn’s entire focus is to make the complex simple, and that message comes across in all her writing, as well as her training programs. Spaced repetition. Because the books are an integral part of the training system, your participants have tremendous spaced repetition happening long after the training days are over. With much training, the value is reduced because people don’t have an easy way to review the concepts. Instead, participants on these courses have Robyn’s easy-to-read books which people typically keep handy for reference and regular re-reading. Comprehensive Getting A Grip On Time Facilitator Manual (over 100 pages). 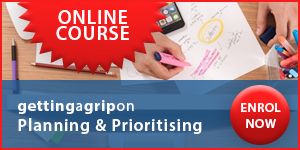 This core 1-day productivity programme can also be used as two modules of 3-4 hours each. One half of the session focuses on ‘Planning and Prioritising‘. The second half concentrates on ‘Overcoming Time Challenges‘ – powerful facilitation to help solve participants’ specific time challenges. 2-CD soundtrack of the DVD. Plus all the items in the Participant’s Getting A Grip On Time Pack. Two books by Robyn Pearce – ‘Getting a Grip on Time‘ and ‘About Time – 120 Tips for Those with No Time‘. 6-set audio CD – complete content of the book ‘Getting a Grip on Time‘ as read by the author. Free Bonuses: Free enrolment in 9-week emailed online course – ‘Getting a Grip on Planning & Prioritising‘ – value NZ$195 (about US$115). This one item will double the value of the course to your participants, because of the follow-up and reinforcement. Free enrolment in the fortnightly ‘Top Time Tips‘ ezine, giving support and useful new information to help people continue to keep on track. Each one has a comprehensive Facilitator’s Manual, a Participant’s Manual and further support materials. You also have ongoing support – extra information relevant to the topic, emailed to your participants once a month for six months. This feature alone allows your training programs to stand out from the crowd, and the best part is, we’ll do it for you. The Getting A Grip On Paper & the Office Environment module has a copy of Getting a Grip on the Paper War – Managing information in the modern office by Robyn Pearce. The Getting A Grip on Delegation & Communication module is supported by Getting a Grip on Leadership – How to learn leadership without making all the mistakes yourself, co-written by Robyn Pearce and US leadership specialist LaVonn Steiner. Cutting edge overview of the topic of time management. A diagnostic to help participants identify their own specific issues. A fresh but simple way to understand and remember the underlying principles of planning and prioritising. Powerful yet practical illustrations on how to be more proactive and effective. Participants are given a simple model to help them minimize the urgent and focus on the important activities. They will discover how to handle the ‘stress’ days with increased ease. Prioritising their weekly and daily schedules, in order to take control of all those ‘necessary’ items, will become much easier. They’ll learn powerful techniques to achieve more balance in all the important areas of their life. They’ll walk away at the end of the day with a greater sense of overall control. You’ll be able to help them with practical ways to work with whatever diary systems they’re already using, or suggestions to improve. A series of thought-provoking questionnaires help people identify the ‘hot spots’ that need attention. A powerful facilitation process helps participants solve their specific time challenges. Even though every module is very practical, this one is exceptionally powerful and practical. The facilitator’s material provides guidance and support for an enormous range of possible issues. Key excerpts from the other four modules in the system are included to assist with specific productivity issues. How to eliminate wasted meeting time. How to avoid or minimize the deluge of unnecessary e-mail. How to manage garrulous or time-wasting staff members. You’ll be able to help them with specific internal company issues which are triggered by this framework. How to delegate and get co-operation from their associates. What to do when their staff are delegating to them! If they’re delegated to, how to help their boss delegate better. How to be pro-active about clear instructions and deadlines. Helping them understand the benefits and barriers of effective delegation. Tips to help them recognise ineffective delegation (including their own). What they can delegate, and what should not be delegated. How to train other people. Personality styles and how they relate to delegation. When it is appropriate to share the work with others, know how to delegate tasks effectively. Learn when to say ‘No’ graciously. Reduce their workload by learning how to recognise when they’re taking on someone else’s work. Manage their priorities without conflict – even when instructions and requests come from two or more associates. Keys to improved communication – how to get the best out of people. How to get the co-operation of others, so that our objectives are met. How to criticise so the other person retains their dignity and we get a good result. How to use the amazing power of praise. To help participants develop strategies to run meetings with excellence, and give them the chance to practice the skills necessary to run effective meetings. To know when and which meetings to attend. How to not waste time in meetings. How to chair a meeting effectively. How to involve all participants, including the quiet ones. Using the company Intranet to assist in scheduling meetings. Rapid minute-taking, and effective use of minutes. How to handle conflict in the group. How to set and run an effective agenda. The issue of time, in relation to meetings. Physical matters of layout and time of day, to ensure maximum participation. Simple, practical and efficient ways of handling the never-ending flow of paper and information in our offices. How to structure our office, our filing systems, and our electronic mail for maximum efficiency. Reduce the paperwork and administrative detail. 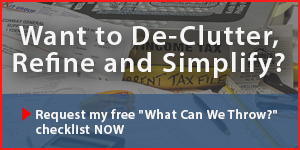 Learn how to control your paperwork instead of it controlling you. Be able to decide quickly what to throw, and what to keep. Make your office space work better for you. Ever felt overwhelmed by too much mail in your Inbox? Ever noticed how addictive email can be? Guidelines for effective email writing. Although this course uses Outlook as a basis for discussion, the concepts are generic and people with any email programmes, and in all stages of email overwhelm, will get value. This course is not a ‘how-to’ computer course on any particular programme. Instead it covers the aspects listed below. Yes – there is life after email! Students range from the newbie who thinks 10 is a high daily quota, to the high-level executives with anything from 200-500 on a regular day. How to write email so the recipient can hear, see and action quickly. The power of email as a marketing tool. Email as a business tool. It’s a simple practise system. Renewable non-exclusive facilitator licences are granted annually through Getting A Grip.com for a very reasonable fee. These include comprehensive and constantly upgraded facilitator materials. As a licensed facilitator you will then purchase your participant materials at wholesale from us. You can on sell at your chosen retail price. This means that each company using the materials only pays for the actual number of people being trained – the fairest way we can find to price the training. Participant materials are purchased at wholesale by the licenced facilitators and can then be resold at your chosen retail price to your participants. This means that each company using the materials only pays for the actual number of people being trained – the fairest way we can find to price the training. The full Participant Packs, bundled with all the support elements and priced at the relevant wholesale rates, are only available to licenced facilitators. Products are supplied direct through GettingAGrip.com or its authorized distributors. Non-exclusive licences are available for anyone in any country with an interest in productivity training who pays the renewable annual practise fee and agrees to our terms of contract. To apply for a license, click here to fill in the application form. If English is not the language your participants will work in, contact us to discuss translation. Yes – it doesn’t matter what country you’re in, although at this stage the materials are in English. As to ease of supply, we have relationships with international printers, book suppliers and freight companies to supply the most economical and timely service possible. If you are in a country we haven’t supplied before, the first order may take a little longer until the chain of supply is established, but we will work tirelessly to make the service as seamless as possible for you. Independent training facilitators or training consultants. Training companies who deliver contract programmes or run public courses. Training departments of large organisations, corporations and government departments. Associations who have a commitment to provide training for their members, i.e. franchise and industry groups with their own training teams. Optional face-to-face facilitator training is available with one of Getting A Grip.com’s team. Email us for pricing, locations and details. The quick answer is yes, although our experience is that it’s unlikely that you will need to. We’ve used this content very successfully with industry groups such as teachers, real estate agents, financial planners, bankers, senior lawyers, accountants and small business owners. Because of the flexible way the workbooks are designed, a skilled facilitator will easily adapt the content to fit the audience needs using relevant stories and industry-specific language. You will unwrap different productivity issues through large and small discussion groups, pairings and exercises, and many guidelines for this are given throughout the facilitator notes. However, if you have different requirements, we’re happy to tailor programs specifically for you for an agreed fee, providing a minimum of 30 days notice is given. Your client uses Lotus Notes instead of Outlook (especially relevant to Getting A Grip on Email & Electronic Overload). You want reference to a Personality Profiling tool you’ve used, rather than the one we reference (relevant to Getting A Grip on Delegation & Communication). There’s some particular productivity process the client uses, which you’d like reference to. No. Some explanatory notes in the other modules link back to support materials in the core module. We recommend 8 – 18 in a group. You can certainly do more, depending on the size and set-up of the room, the skill of the facilitator and the number of facilitators. However, smaller groups will get higher value, due to the more relaxed and intimate environment and higher level of interaction. License all five modules at same time, you pay only NZ$6,950 per year. Higher volume users: If you use more than 20 units per module per year, the renewal fee for that module is waived for the coming year. Train The Trainer Training – 2 days. Day1: Observe and participate in an in-house programme run by Robyn Pearce and regular participants from your company. Investment: Regular fee your organisation would pay to have us run an outsourced programme. Split fee structure, dependent on whether your organisation is a commercial or NFP entity. Day 2: Facilitators Only – with Robyn, dissecting the philosophies, methodologies and special techniques of the programme.